Meet Taka-san. He is a great friend and my fixer for the Yakuza project entitled "Odo Yakuza Tokyo". 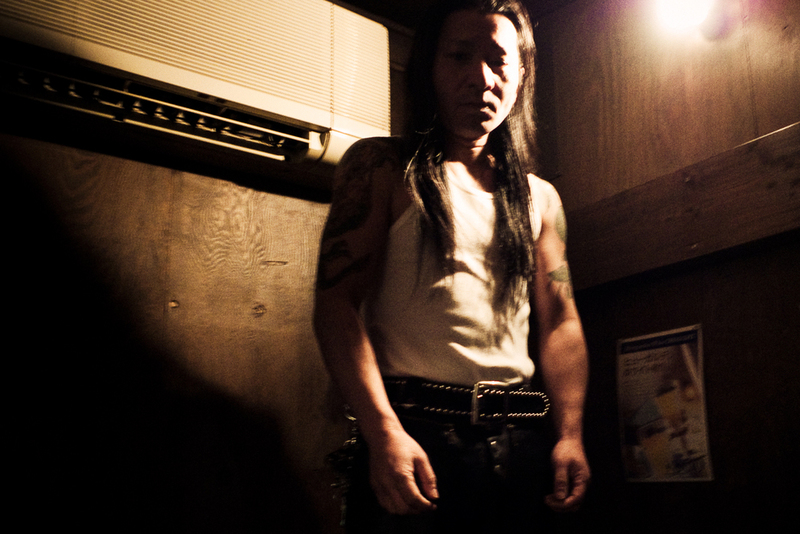 He runs a tiny bar in the heart of Kabukicho in Shinjuku, Tokyo. Taka's bar is totally unique. Even in comparison with the area Golden Gai, plastered with hundreds of cool little bars in as many styles, that seat a maximum of about 12, Taka's bar only has room for 4. His bar is literally a big box in which you can't even stand upright. No running water, no fridge... just a cooler with a block of ice and a pick, punk music off a battery powered "discman", and the walls plastered with movie posters and business cards of people that have visited and got drunk.... yes... mine included. Sometimes i sit there, drinking a beer, and I realize: "look at me, sitting here in a frantic city with 20+ million people around me, away from home completely on the other side of the world, in a tiny claustrophobic bar that holds 4". It does feel quite surreal. Taka's bar is effectively my base of operations in Kabukicho. As contradictory as it sounds, this bar, frequented by prostitutes and pimps, businessmen and yakuza, old and young, is the safest possible place for my gear. I also regularly check in at night when roaming the streets.... his opening hours are midnight 'til about 7am. Just a quick pop in to say hello ensures him that i'm ok, and he regularly calls when he knows I'm out shooting (that is, if he is not actually physically with me, of course). Then a month ago Taka-san went missing. As he guarantees my personal safety, my brother and I were worried to say the least. With an upcoming trip to Japan only a few weeks away (I was in Belgium at the time), and everything set in place, ready to go, we didn't know what to do. Nobody of his friends knew where he was, or what had happened. My brother tried calling him for days, but his phone appeared to be switched off or disconnected. This lasted for two weeks... in the third week we noticed the phone had been switched on again, but we still could only reach voice mail. What had happened? Also, the deadline to come to Japan was coming closer. Decisions needed to be made. Should we call off the trip? Cancel? Postpone? After long talks my brother and I decided to continue as planned: as the first meeting with the Yakuza was planned only for a few days in, it effectively bought us more time to try and find Taka-san, and also put a backup plan in place (which involved me shooting images related to living in Kabukicho in general). The night I arrived at the airport, he called us... All was ok... Apparently he had taken a holiday for a couple of weeks, and had switched off his phone in the process. He was genuinely touched by our worries... We're still finding out the real reason... but... he definitely owes us a beer.